Figure 5. Temperature reconstructions created using the 650-tree (?alltrw? data) TRW chronology (a) and the 130 tree (?S88G1112? data) MXD chronology (b). 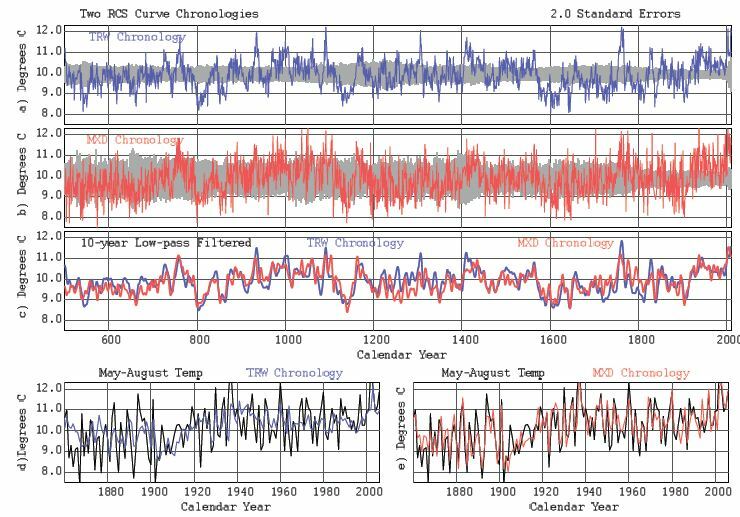 Chronologies were created using two RCS curves and were regressed against the Bottenviken mean May?August monthly temperature over the period 1860 to 2006. The shaded areas show two standard errors (see SI15, available online, for details) plotted either side of the mean where standard errors were scaled to fit the temperature reconstruction. The TRW and MXD temperature reconstructions of (a) and (b) are compared in (c) after they were normalised over the common period 600 to 2008 and smoothed with a 10 year spline. The lower two panels compare the reconstructions using the TRW chronology (d) and MXD chronology (e) with the mean of May to August monthly temperature from Bottenviken over the period 1860 to 2006. Look at graph 5c, and you?ll see 20th century warmth matches peaks either side of the year 1000, and that for the TRW chronology 20th century warmth is less than the spike around 1750. This puts 20th century (up to 2006 actually) warmth in the category of just another blip. There?s no obvious hockey stick, and the MWP returns, though approximately equal to 20th century warmth rather than being warmer. Post-1960 values of the Briffa MXD series are deleted from the IPCC TAR multiproxy spaghetti graph. These values trend downward in the original citation (Briffa , see Figure 5), where post-1960 values are shown. The effect of deleting the post-1960 values of the Briffa MXD series is to make the reconstructions more ?similar?. The truncation is not documented in IPCC TAR. I have to wonder if this is some sort of attempt to ?come clean? on the issue. Mann must be furious at the timing. There?s no hint of a hockey stick, and no need to splice on the instrumental surface temperature record or play ?hide the decline? tricks with this data. It rather puts all that previous work in perspective, since this new paper has identified and corrected the biases. It should be noted though that tree ring paleoclimatology is an inexact science, and as we?ve seen, even a single tree can go a long way to distorting the output. On the plus side, it is good to see that this paper defines and corrects biases present in the MXD and TRW series of the Tornetraesk tree ring chronology dataset. This is a positive step forward. I suspect there will be a flurry of papers trying to counter this to save Mann?s Hockey Stick. We describe the analysis of existing and new maximum-latewood-density (MXD) and tree-ring width (TRW) data from the Torneträsk region of northern Sweden and the construction of 1500 year chronologies. Some previous work found that MXD and TRW chronologies from Torneträsk were inconsistent over the most recent 200 years, even though they both reflect predominantly summer temperature influences on tree growth. We show that this was partly a result of systematic bias in MXD data measurements and partly a result of inhomogeneous sample selection from living trees (modern sample bias). We use refinements of the simple Regional Curve Standardisation (RCS) method of chronology construction to identify and mitigate these biases. The new MXD and TRW chronologies now present a largely consistent picture of long-timescale changes in past summer temperature in this region over their full length, indicating similar levels of summer warmth in the medieval period (MWP, c. CE 900?1100) and the latter half of the 20th century. Future work involving the updating of MXD chronologies using differently sourced measurements may require similar analysis and appropriate adjustment to that described here to make the data suitable for the production of un-biased RCS chronologies. The use of ?growth-rate? based multiple RCS curves is recommended to identify and mitigate the problem of ?modern sample bias?. If the good fit between these tree-growth and temperature data is reflected at the longer timescales indicated by the smoothed chronologies (Figures 5c and S20d, available online), we can infer the existence of generally warm summers in the 10th and 11th centuries, similar to the level of those in the 20th century. order to avoid systematic bias in chronologies.
? It was found in the Torneträsk region of Sweden that there were systematic differences in the density measurements from different analytical procedures and laboratory conditions and that an RCS chronology created from a simple combination of these MXD data contained systematic bias. be taken into account when assessing the need to adjust subpopulations of tree-growth measurements for use with RCS.
? It was necessary to rescale the ?update? density measurements from Torneträsk to match the earlier measurements over their common period, after accounting for ring-age decay, in order to remove this systematic bias.
? The use of two RCS curves, separately processing fastand slow-growing trees, has reduced the effect of modern sample bias which appears to have produced some artificial inflation of chronology values in the late 20th century in previously published Torneträsk TRW chronologies.
? The method described here to test for and remove systematic bias from RCS chronologies is recommended for further studies where it is necessary to identify and mitigate systematic bias in RCS chronologies composed of nonhomogeneous samples. This entry was posted on Monday, October 29th, 2012 at 4:11 am	and is filed under News. You can follow any responses to this entry through the RSS 2.0 feed. Both comments and pings are currently closed.